I spent this past Sunday on the road heading to Vermont to check out a gun show in Rutland. As I was chewing up the miles of my journey, one littered with the aftermath and final protestations of the Nor’easter that rolled through the region to kick off March, I began to think of an attack someone made on me not too long ago, challenging my Christian faith with regards to my willingness to carry and use a gun in order to protect myself and harm another. Before I get into that I will say that I was particularly going to a gun show because the AR-15 that I had planned on purchasing earlier in February and was just getting around to buying had DOUBLED in price (if it hadn’t all ready been sold out) from the online dealers that I had visited. And with the aforementioned storm kicking motorcycle season a few weeks down the road I decided that a gun show would soothe my disappointment, hoping to find a reasonably priced AR-15. Suffice it to say, it was like locusts swarming the fields by the time I got there on Sunday and there was nary an AR-15 under a $1000 to be seen. I mean, there were .22’s available but…come on. So now that I have this beautiful piece of functioning art let us answer the question that I was mulling about on my drive, how do I rectify what it can do with my Christian faith? First and foremost there is a misconception, that heathen atheists on the Left love to promote, that says Jesus was a long haired socialist hippie and to be a good Christian is to be one too. They twist things like “turn the other cheek” and “live by the sword, die by the sword” to make it seem like Jesus was promoting pacifism. Let me be clear, Jesus was not a warmonger…but yet he was no pushover nor did he expect his followers to be. Let’s break that down. Jesus says that if you are going out take money to pay your way, and take a bag in which you can carry supplies. But if you do not have a way to protect these things and yourself, then it is better to go cold and sell your cloak so you may protect yourself with a sword. And this is no metaphorical sword that the Leftists would have you believe. The disciples literally produced two swords for Jesus to inspect and he said that would be enough. So Jesus says you should go about armed. But what about turning the other cheek? Valid question. But then again one must ask what does it mean to turn the other cheek? Jesus is preaching a measured response to insults. A conciliatory stance if losing in civil court. If someone needs you to go one mile, you go a second one. Basically be a good Christian neighbor. Do not hold grudges. Do not let petty grievances weaken your Christian character. Then there’s the old chestnut from Matthew 26, those who live by the sword shall die by the sword. But who lives by the sword? Bandits and criminals live by the sword. They use violence and forceful, underhanded methods against other people. And in such a manner shall things be turned and used against them. But does a person who wields a sword in self defense live by the sword or do they save with the sword? Is it not a fitting fulfillment of Jesus’s prophecy that those who use weapons for evil means would be stopped by the same weapon wielded by the righteous? Going back to Luke 22:36 I believe that is exactly what it means. Every soldier knows there is a world of difference between killing and murdering. So does the mother who shoots the man who is about to kill her children. So does the cop who protects the public from a dangerous criminal. So does the hangman who carries out the rule of law. 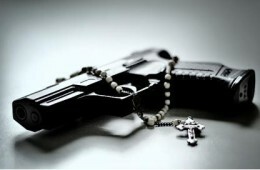 As Christians, having a gun and being willing to use it does not diminish our faith or make us hypocrites. On the contrary, it strengthens us because the right of self defense is a God given right that he has bestowed upon us. The sword may have given way to the gun but the blessing of self determination on how we protect this gift that the Lord Almighty has given to us has not changed. Sell your cloak to buy a gun. Do not overreact to small slights, be helpful to those in need. Do not take from others by force lest by force you will be stopped. Commit no murder but save the righteous. So when someone asks how I remedy being a Christian and being a gun owner I tell them no remedy is needed. I simply follow my Lord and Savior’s commandments and stand ready to defend my life, the greatest gift He has given me…as He expects me to.